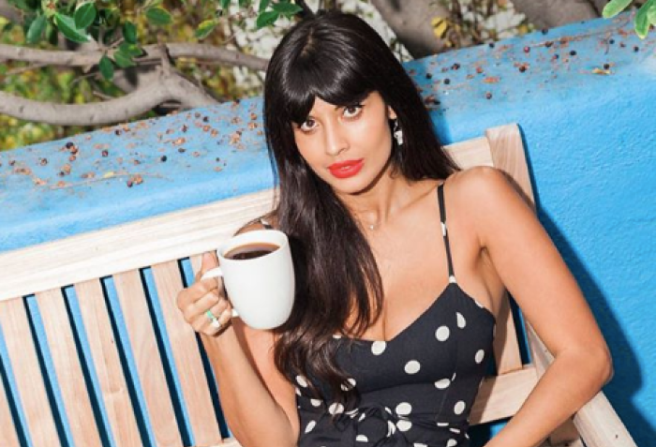 ‘Discount code is in my bio’: Jameela makes EPIC diet tea video | SHEmazing! Jameela Jamil might have just won 2018 – like seriously, someone give her an award. Taking on the world of diet teas, the presenter made an EPIC video which takes the piss out of the false promises influencers and celebs can make about some weight-loss detox products. The 32-year-old captioned the video: "If celebs and influencers were actually honest with us about some of these diet/detox products…"
If you tell your fans to be thinner, you don’t love your fans. You don’t give a sh*t about them or their mental health or self worth. The video begins with Jameela in a yellow dress, with a glass of green liquid in hand. She starts to mimic the same scripts we are all too familiar with when hearing about the diet teas. She starts to exaggerate to highlight the ridiculous claims some people make about the drinks: "I've only been taking it for three days and I've already lost 35 pounds and I've got abs…"
Then commences some more realistic side effects that the liquids can cause – and if you've got a weak stomach, turn off the sound. The actress is seen on the toilet with all those juicy sound effects in the background. Still sticking to the script, her make up is now run down her face and we feel sweaty just looking at her. "Discount code is in my bio…it burns" she finishes. We honestly love her so much for being so honest with her experiences with certain detox products. So if you are going to buy a diet tea, make sure you know exactly what it does to your body. We LOVE the real body positive messages that Jameela preaches.